Ganpati or Ganesh Chaturthi would have to be one of the biggest festivals in Mumbai. The festival is in honour of Lord Ganesha, who is the remover of obstacles. 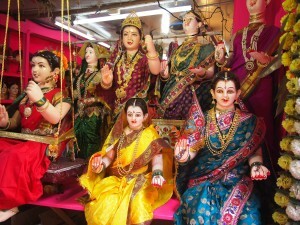 A Ganesh statue is traditionally installed in the home, or in the neighbourhood in many cases, and people worship it for 10 days. The statue is then taken to water and immersed. In actual fact there are 4 days over the 10 day festival where people take their Ganesh for immersion (or visarjan). It’s this that has made me fearful of Ganpati festival. Blocked roads for miles, as people sing next to carts that they wheel ever so slowly to the ocean. But this year I decided Ganpati had to be different. 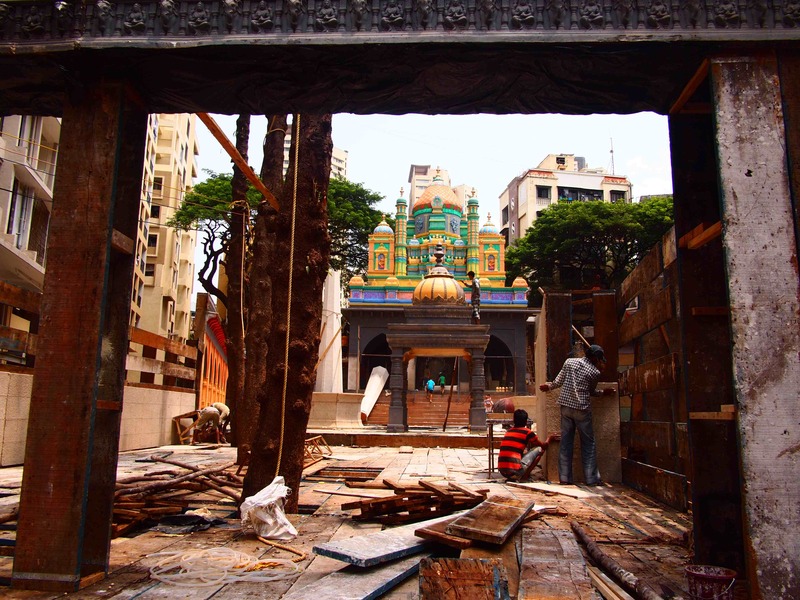 So when a friend suggested I go to one of the most famous Ganpati areas in Bombay to see how they set up for the festival, I took it on as a challenge. Lalbagh is a region in Mumbai that is home to the Lalbagh Ki Raja, or the King of Lalbagh. It’s a huge statue that has up to 1.5 million visitors a day, people are known to queue for days (literally) to catch a brief glimpse of him. So it’s not surprising that the area is known for its Ganesh workshops. It’s outside one of these workshops where I started a tour of the area with Beyond Bombay. Here we saw artists hard at work putting the finishing touches onto their statues. 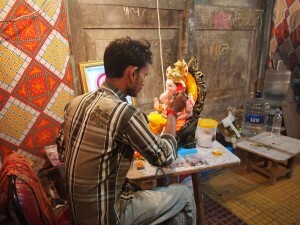 According to our guide, the artists work all year round, taking a break only when the actual visarjans are occurring. While traditionally the statues are made with mud, which also means they are bio-degradable, unfortunately many are now using plaster of paris. The reason being that it is much quicker to make these statues, but this means they aren’t able to be absorbed by the sea, and will instead just contribute to the ever-growing pile of rubbish in Bombay and its surrounding sea. 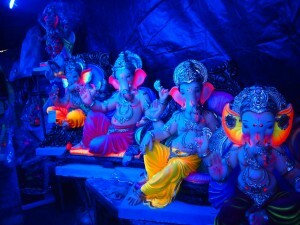 While they may look great, these disco Ganesh’ are creating more obstacles than they’re removing. The tour took us through a few different workshops and then through the market. 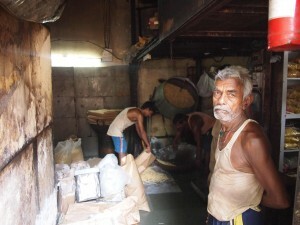 Like most markets in Bombay, it was a bustling market, but with one main difference. 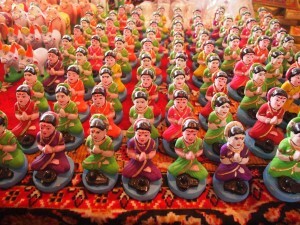 Most of what was being sold was in preparation for Ganpati and Gauri Pooja. 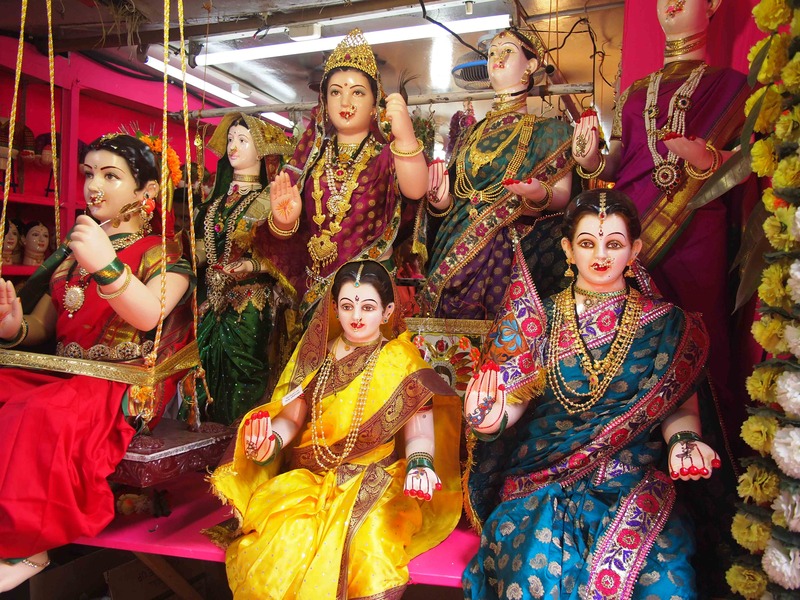 Gauri Pooja is one tradition that is observed during this festive season, where married women dress up, spend time with their friends (traditionally they stay up all night!) and pray to an idol before immersing it in the water. 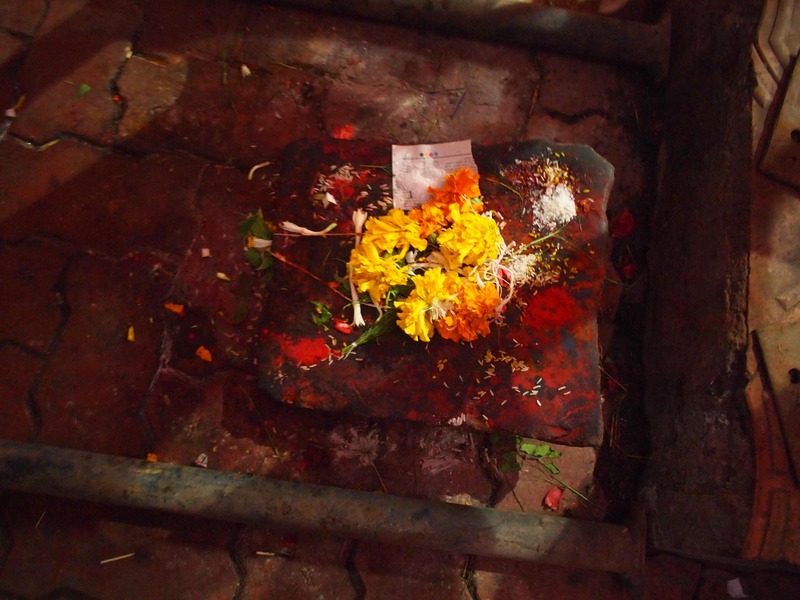 This usually occurs on the 4th or 5th day of Ganpati. We were then taken to the section of the market where the long queues to see the Lalbagh Ki Raja start. The big man himself was being constructed, but was well hidden behind plenty of scaffolding and fencing. There was no chance of sneaking a peek unfortunately, but we were able to see the foundation stone that stood outside the fence, representing the statue until he is unveiled (which will be on Friday August 29th). People bent down to touch and worship the foundation stone as they walked past, in displays of respect. Behind the large area that houses the Lalbagh Ki Raja is a small laneway where snack makers are hard at work producing plenty of crunchy and tasty treats. Just watching them with their huge vats was mesmerising, but the best part was standing in front of the stall keeper, sampling all the different flavours so that I could choose the ones that I wanted to purchase. This shop was making chevda. A mix of nuts, corn flakes, puffed rice and spices that is almost impossible to stop eating once you start. A little further down the road we headed to a street aptly named Ganesh Gully. It is here that a new temple is constructed each year in a different style, just in time for Ganpati. Last year was a South Indian style temple we were told, this year, looks a lot more North Indian. While it was interesting to watch all the workers furiously putting together this temporary temple, I couldn’t help but feel disappointed that almost the entire construction was being made from non-biodegradable products. This environmental mess would no doubt end up polluting the already clogged sewers, waterways and streets. All this money and waste in the name of religion. From here we headed back to the main street for some piping hot vada pav. The perfect way to finish off a tour of the laneways of Lalbagh. Now we just sit and wait for Friday, when Ganesh comes to town… everywhere!